New York, May 18, 2012 - Leaders and Trustees of The New School, professionals from AECOM's Tishman Construction Corporation construction-management practice, and hundreds of construction tradespeople celebrated the "topping out" of the University Center, marking the completion of vertical construction. Located at 65 Fifth Avenue between 14th and 13th Streets the 16-story University Center will provide a new focal point for The New School, which over the past decade has transformed into a major degree-granting university. The University Center is The New School's largest-ever construction project, adding to the university's Greenwich Village campus 375,000 square feet of classrooms, a library, an auditorium, a 608-bed student residence, and other facilities. Designed by SOM's award-winning architect Roger Duffy, the University Center will serve as a central meeting point for students and faculty across the university's disciplines, including art and design, liberal arts, social research, and the performing arts. In addition, the University Center will be one of New York's greenest buildings, with a projected LEED (Leadership in Energy & Environmental Design) Gold rating, and innovative sustainability features including a rainwater-saving green roof, for which The New School recently received a grant from the New York City Department of Environmental Protection. "Today is the culmination of years of planning, community-building, discussion and design," said David E. Van Zandt, president of The New School. "The Univeristy Center is the future of The New School, and it will be a building without peer in higher education. We thank Tishman Construction, our architect and engineers, and all of the construction trades people for getting us to this important milestone." 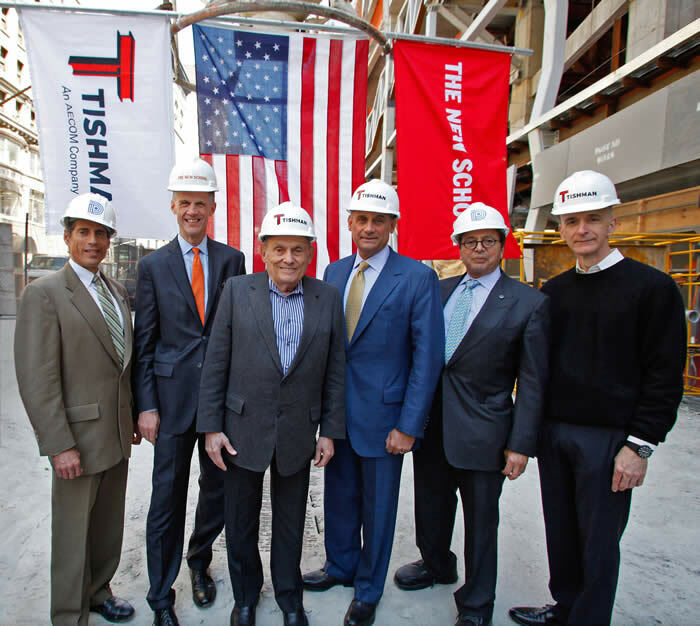 "Topping out ceremonies for the projects we build are often a source of pride and emotion for everyone at Tishman," said Daniel R. Tishman, Chairman of Tishman Construction and Vice Chairman of AECOM. "Today's ceremony brings a special sense of joy because of my family's long association with The New School and with my father's leadership and service to the school. This remarkable new building brings to fruition the long held vision of him, his fellow trustees, and The New School leadership past and present. We're honored to be a part of it." Political and community leaders also hailed the University Center's topping out. "This is a great day for an exciting project and a venerable institution," said Congressman Jerry Nadler (D-NY). "I am happy to have helped secure federal funding for a building that will be both an educational beacon and a LEED-recognized green building." "We are thrilled that The New School has reached this milestone in the construction of their new University Center," said Jennifer Falk, executive director of the Union Square Partnership. "The New School has played a vital role in Union Square's resurgence and this investment is just another example of their positive contributions to our neighborhood. The Union Square Partnership looks forward to building on our history of successful collaboration with the university as we continue to work together to support and grow our community." "Community Board 2 shares in the New School's appreciation of its construction team on reaching the end of vertical construction, and we look forward to the day in 2013 when the University Center is complete," said Bob Gormley, district manager of Manhattan Community Board 2. To learn more about The New School's University Center, visit www.newschool.edu/universitycenter. Contact Sam Biederman (biederms@newschool.edu) for high-resolution photos and renderings. The New School, a leading progressive university in New York City, was founded in 1919 as a center of intellectual and artistic freedom. Today The New School is still in the vanguard of innovation and experimentation in higher education, with more than 10,000 undergraduate and graduate students in design and the social sciences, the humanities, management, and the performing arts and thousands of adult learners in continuing education courses. Committed to public engagement, The New School welcomes thousands of New Yorkers yearly to its celebrated public programs and maintains a global presence through its online learning programs, research institutes, and international partnerships. Learn more at www.newschool.edu.